The Mummy is sitting pretty on top of a pile of cash. Click here to play! You'll need to spin the reels for a chance to steal the Mummy's Munny and claim it as your own! The Mummy is the main symbol in this 3 reel game. Spin this petrified corpse three times across any of the five pay lines to win big. In fact, three mummies across line one will bring in 1000 coins, line two will get 1500 coins, line three will get 2000 coins, line four will get 2500 coins, and line five will get you 5000 coins! The mummy also acts as a substitute and will replace all other symbols to help you bring in more wins. Don't forget about the sevens. Three purple sevens across one of the pay lines will get you 80 coins. There are also triple, double, and single BARS. These symbols will pay out as well, if you can spin them across the five pay lines. 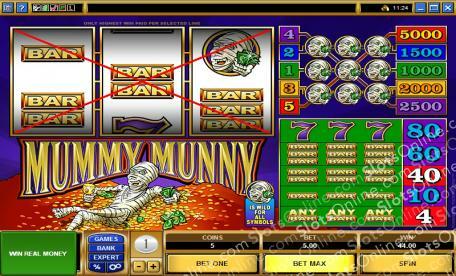 Spin the reels in this traditional 3 reel game to see if you can capture the Mummy's Munny! The mummy is a substitute and will replace all other symbols to help you bring in more coins!